Tuned 335i as a track car? BMW 3-Series (E90 E92) Forum > E90 / E92 / E93 3-series Technical Forums > Tracking, Autocrossing, Dragstrip, Driving Techniques > Tuned 335i as a track car? OK I am looking to get a used 335i. What are people’s experiences with tracking a tuned 335i? I am talking about road course's, not drag racing. I don't want to be experiencing any limp mode situations on the track. My other alternative is a E46 M3, which has been proven to be a reliable track car. Any info from people that track their 335i's on a regular basis would be really helpful. go with a E46 M3. it's lighter and more sportcar than the 335i. IMHO if you're looking to do anything more than DE's, then the e92 is too heavy a starting platform for a dedicated track car. If you're looking to dual-purpose (track and occassional) street, then it works just fine. you better hope your SA doesn't leave his job anytime soon. Agreed. I use mine as a primary street, but occasional track and it is just fine. I haven't had any limp mode issues as of yet (although I'm headed up to watkins glen in 2 weeks and I expect ambient temps to be in low to mid 90's). We'll see how it holds up. My only mods are a set of track wheels/ non-rft tires all around and Hawk HP+ pads on the front. Bone stock otherwise. I will mention that the owner of Bimmerworks (a tuning shop in West Chester, PA) just bought a 335i coupe he is converting into a race car. So far it's been gutted down to strip the inside, added a roll cage, seats, harnesses etc. I think it had PSS9s on it and some stickier non-RFT rubber when he bought it (used), and that's about it. He said it was running quite well, and he was running lap times just shy of 996 GT3s. My guess is that if you wanted to spend some $ tuning the car, it could be a competent track car. I just think you could do more for less $ with an e46 M3 or even an older 993 porsche. No limp modes, conservative tune, upgraded brakes, wheels, tires, exhaust, and suspension (coilovers). Car does run hot if ambient air temp is over about 80 degrees. I would not do a 105 degree event at Buttonwillow/Willow Springs/Thunderhill in the summer months. i guess thats why i never see a 335 at buttonwillow =/ no one to play with! Pardon? There were about 8 335s this past weekend at Button. At least one running hard in the A group and one being flogged by a very competent instructor. I didn't hear of anyone having any issues. Last edited by satakal; 08-16-2011 at 05:41 PM. I had one limp where the car cut off the power all together, but I don't even think it was a hard limp since the oil temp was not at 300, maybe at 280 or so, and the engine reduced power light never came on..
My guess is that if you wanted to spend some $ tuning the car, it could be a competent track car. I just think you could do more for less $ with an e46 M3 or even an older 993 porsche. I will be using it on the street as well, but I will be tracking it very often. Starting to think the E46 M3 might be the better choice also. Don't really care about the SA. I will be working on the car myself. I am just worried about the twin turbos and how much abuse they can take. Looks good, sounds like if I keep the engine near stock form it shouldn't be a problem. But I am not sure if I can stay away from the easy power upgrades like procede. This is what I am worried about. 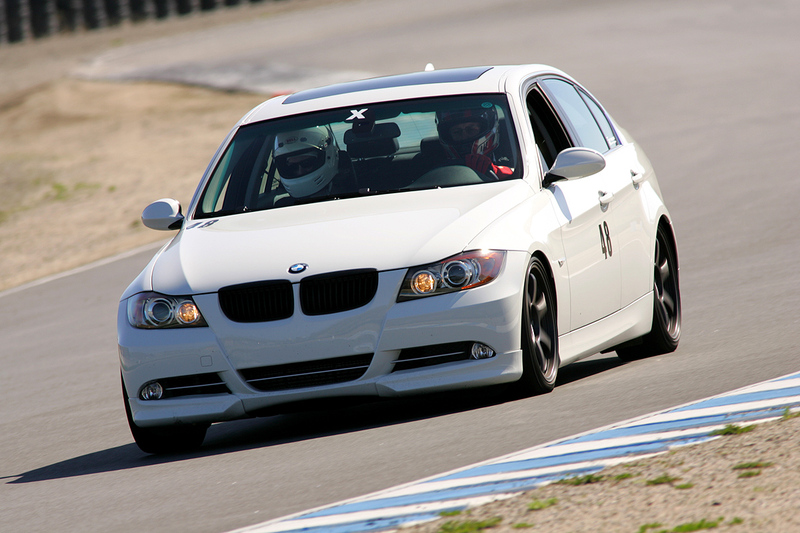 I remember edmunds or MT testing the 335i around the track, after about 5 laps it went into limp mode. No way man, I got it down to an art. I remove the engine underpanel, jack the car up between sessions (full front up on jack stands), put a water biased mixture into the coolant tank, and run it like hell. If I'm lucky and it's had a while to cool down, it'll last till the checkered in a 20 minute session. Friday I had 6 30 minute sessions so I did 13-15 minutes on track, pulled off for about 2 minutes and left the car off and then went back on until checkered. .
Are you at all concerned about the long term impact of those elevated oil temps on the long term durability of the machine? I love the 335 but I find it ridiculous that a new $45k sporty car doesn't have adequate cooling capacity to handle sustained track use. I'm tremendously concerned. I mean, I'm doing everything I can to combat it. I can't really do much until VK releases the retrofit. I really just don't want to sacrifice my driving education because of this cars stupid oil temp issues. This is my first year tracking and I'm getting a ton of time in and progressing rapidly, so if I have to push the car a bit I'll worry about that later. Abstain from track use until you have the new cooling system parts? I don't know if longodj mentioned it but he also has no factory oil cooler. I've been tracking mine at all three main tracks in the bay area and have only limped once at Laguna. I went to track my car over the weekend, it went limp mode on 2nd or 3rd lap everytime when I went in. It threw couple of P0015 code and the rest of the limps were no code or at least didn't show on the C-reader. I have factory oil cooler!! I've been tracking mine at all three main tracks in the bay area and have only limped once at Laguna. Originally my car did not have the oil cooler. I complained and they installed one without having to be asked twice. I guess they feel like they did their part. As for me -> VK oil cooler upgrade. I also think it has to do with how the car is driven on the track. I don't wind it out in the turns. There enough torque in the middle of the the band to provide plenty of throttle steer. You don't need to drive it like it's NA. haha...how you drive it on the track.....so a proper flogging isn't good for it then?